HoustonWorld Series and Baby Adley – RV There Yet? After you read this, go look at Instagram and Facebook for Taylee Hudson Photography and like her page (or just click the handy links I provided). My daughter is starting her photography business, is really good at it, and pretty cute too. She is a photography major at BHSU. Also, if you haven’t met her you are missing out on one of the true gems in life. Love you Taylee. You are the best! Photo: Sam Johnson posing for her auntie on the big shopping trip. Sorry, I’ve been MIA for two weeks because I was busy flying to Houston to cheer on the Astros for the World Series. Just kidding, I’m not that cool but I did drive by Minute Maid Stadium on my 40 mile taxi ride from IAH to my sister’s house. (You read that right, 40 miles, 1 hours and 10 minutes in the same city). The sea of orange in downtown Houston made me momentarily long for the days when I was spontaneous and fun, but I quickly realized by the time I got to my Shelby’s house, changed into orange (which I didn’t pack) and drove down to the stadium it would be well passed my 8 pm bedtime. Also, the $700-$1200 price tag for one ticket was not at all enticing. Anyway, congrats Astros!! You were fun to watch on the couch for free. The Cubs- My grandpa Morris was an avid fan. He had a stroke at age 65 which left him speechless and paralyzed, but his joys in life were his family, candy, and the Cubs. I cried real tears when I saw Wrigley Field for the first time and ate at Harry Carry’s bar in his honor. The Yankees- My good friend, Pina, loves the Yankees with her whole heart and I love her so it’s an obligatory respect. Just like she likes the Broncos for me. Ridge, Sami, and Adley Rae Sunshine (as her brother likes to introduce her). I apologize for the quality of these pics, the iPhone can only do so much. This was my first time meeting Adley and I quickly fell in love. Between my mom, Shana, and I, Adley was hardly put down the entire weekend. Shelby has perfected parenting so if you need any tips ask her. She has the sweetest kiddos that live way too far away!! Upon arriving to Houston, we promptly went to get pedicures like any good family does. The next day was filled with shopping in the Anthropologie region of Houston. If you don’t know what an Anthropologie region is, let me fill you in. When traveling to a large city, google the nearest Anthropologie and you will arrive in a downtown area filled with cute shops and restaurants. It never fails. Houston has two so the potential for two cute areas exists, although we went to the Highland Area. Another tip for the Anthropologie district is to try on what you love, go home and put the items in your online basket and buy whatever it is when it goes on sale because the store is a bit on the high priced side. On a side note, my friend Kelli recently went to New York and said this was her favorite store as well so I think my theory can easily be applied nationwide!! Back to cute restaurants, we ate lunch at Ruggles Green which provided good food and outdoor seating (a requirement for me). Ruggles Green has been changed to Bellagreen but they haven’t changed the sign yet and is in several locations in Houston. My sisters (and mom) are on the top of my most important list, followed closely by their children. We have been through a lot, as I have come to find out most families have, and have made a decision to love each other more instead of let the problems that exist drive us apart. PS: Can you all move closer to me???? We had to fly out Sunday so Bill could be back to school on Monday, but made a quick trip through Denver to see Timber which will be highlighted in the next post as these quickly get really long. Thank you City of Houston (and Tate Johnson) for your hospitality, take care of my sister and her family- they are gems!! 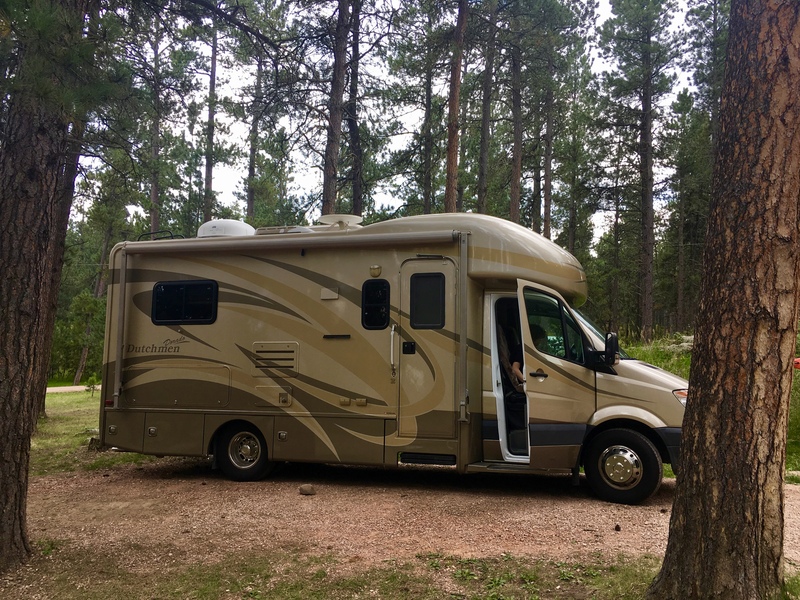 *It is 29 degrees in South Dakota as I write this so the RV content will be limited. It is on my agenda today to go run the generator for an hour, although I’m at a loss for what I will do in that hour. Read a book? Take a nap? Crochet? Drink more coffee? Jog around the Black Hills? Hmm. I did find this handy tip on Pinterest about how to keep your holding tank sensors running. It also explains how they work. Totally going to try this in the spring. Hopefully, you will find it helpful too! Thanks for reading and have a good week.